General mummy related chit chat sharing insight and advice based on own experiences and providing empathetic words of help and support are acceptable. I don’t think I ever really truly help situations, but I try to with willing words of comfort and support! Visual judgements and/or unwelcomed comments (i.e. from know-it-alls and also some Health Visitors) are not acceptable in my world. There is a difference between being helpful and supportive versus making us new parents feel inadequate. It’s not about if you had a drug free labour or escaped any tearing downstairs; if a baby is here safe and sound then none of that matters. 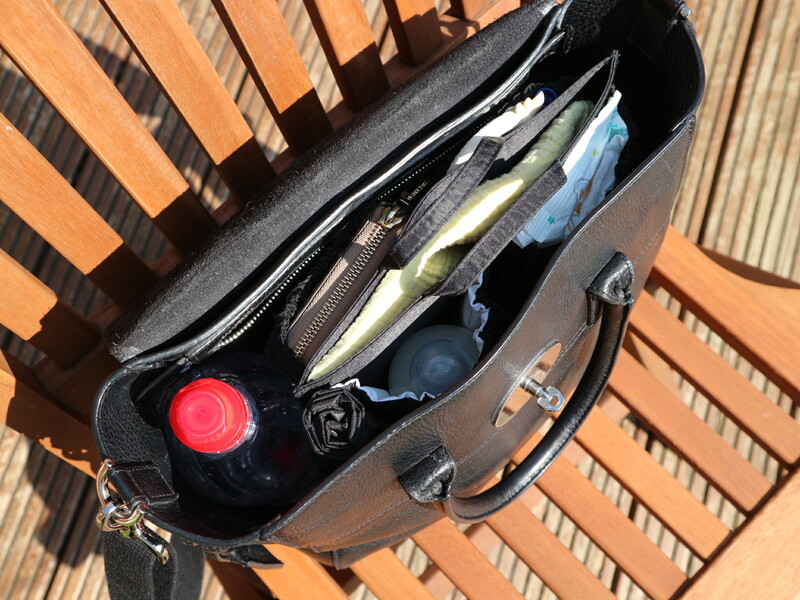 It’s doesn’t matter what gadgets or top of the range prams your friends own which you don’t. 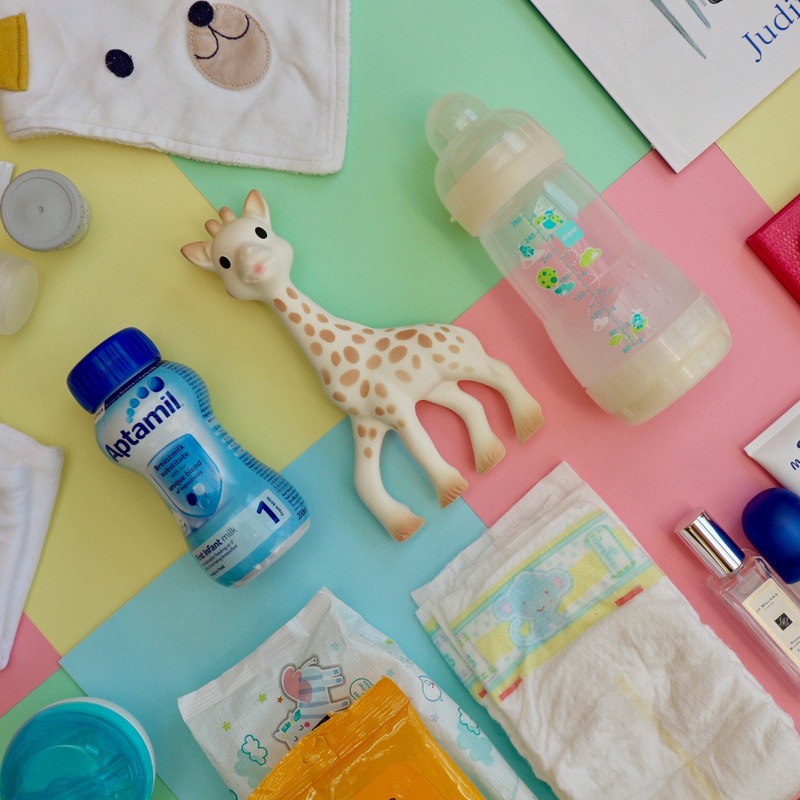 It’s not about whether your baby is sleeping through the night or if you are still breastfeeding (which is a job in itself and I managed 4 months – combination fed – breast and formula). 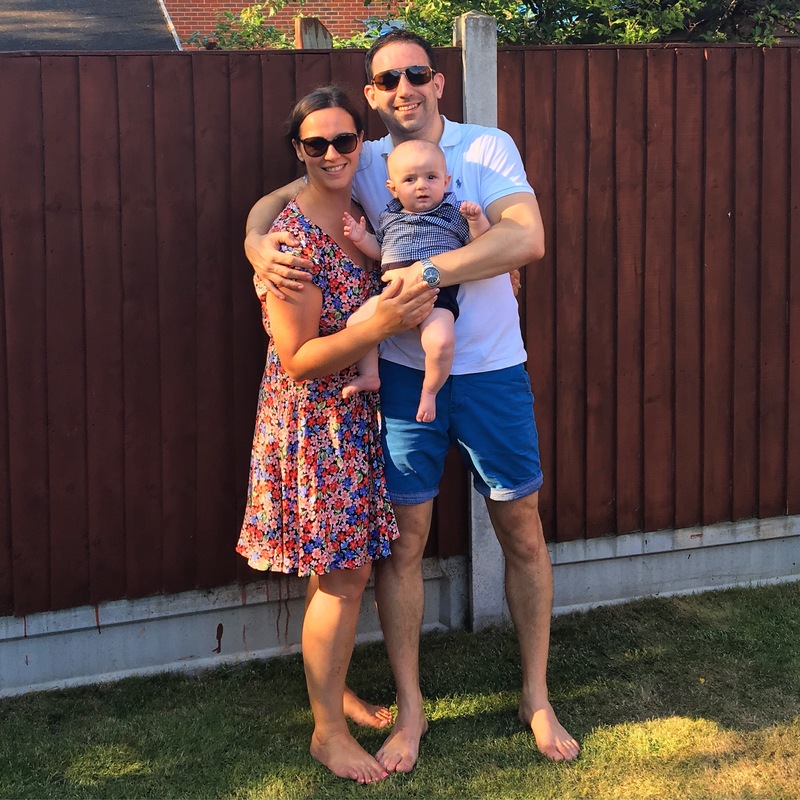 I’ve learned from The Unmummsy Mum to never discuss breastfeeding or whether breast or fed is best on my blog – ever! People get so nasty and too opinionated with their opinions! And it’s certainly NOT about how much baby weight one still has left to lose. Mine’s a stone btw – so put that in your pipe! Now, turning this blog post into a positive…which is how it should be. 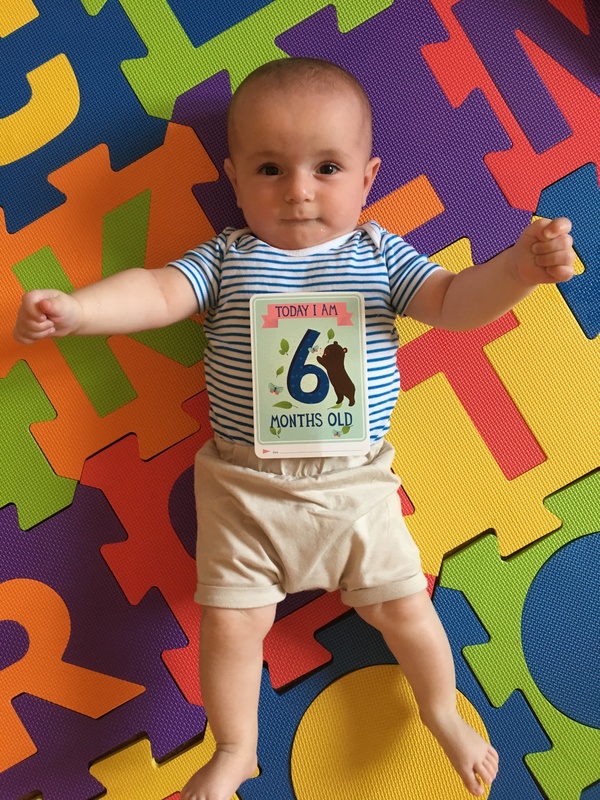 My Henry is 6 months old… SIX MONTHS!! I honestly do NOT know where the time has gone (as everyone in life says on a daily basis). In summary; I am so thankful for, in love with and in awe of him. I’m beyond happy for the little happy chappy he is growing to be. To me, he is my perfect son whom I’m already so proud of, as are all my mummy friends are in love and proud of their little ones too. It’s utterly heart-melting! You may have seen my 3 month postpartum update (if not click here) but since then the jumps in Henry’s development are vast. 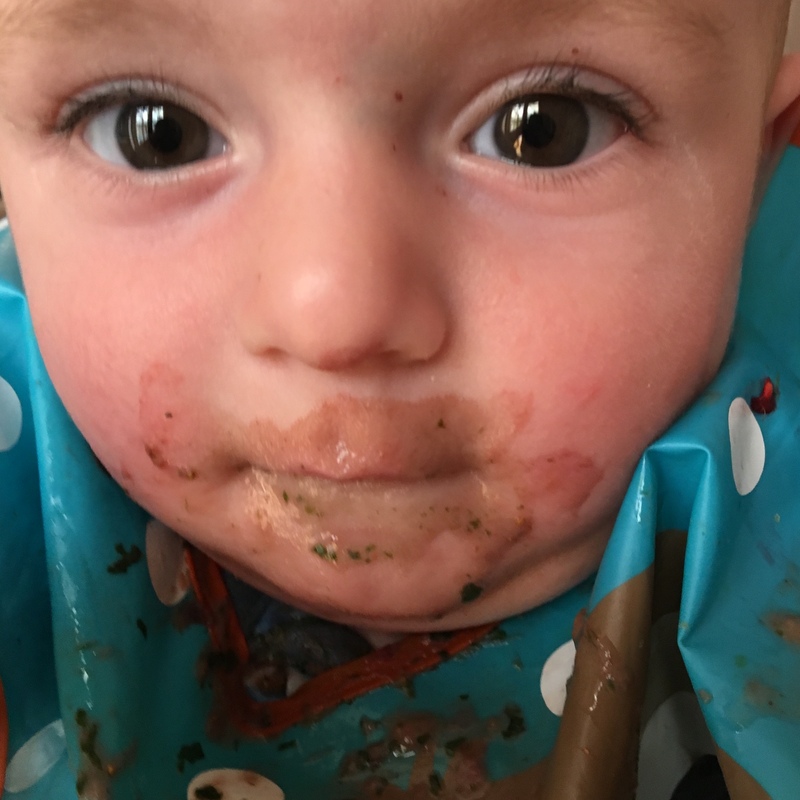 We’re now rolling, sitting up (albeit a tad wobbly at times), sleeping in our own room and we have started the weaning process, enjoying lots of fruit and vegetables. Henry also LOVES porridge and would have banana at every meal time if he could! I love how he can sit and play with toys, entertaining himself and learning new skills. 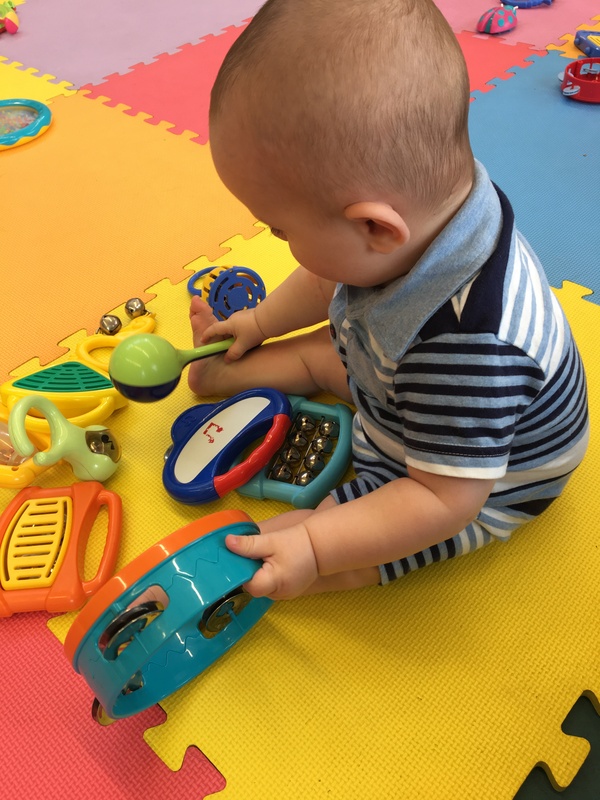 This is with great thanks and help from his weekly Caterpillar Music and Baby Sensory classes. These are all processes in themselves, they don’t (all) just happen by themselves. Motherhood is a job yet not everyone realises. I do not mean this in a patronising way at all as I am guilty of not truly understanding or “getting it” until I myself became a mother. It is more than feeding, changing nappies, caring for etc. For me it’s about creating a world of happiness, a network of opportunity for him and most of all, a friendship. Henry is my buddy, we go to our baby groups together, I take him swimming, we go on picnics and more recently to the swings. He LOVES the swings!!! We do all of this together, just us two, and we also enjoy these things with other mummies and their babies, as well as with Daddy at weekends. 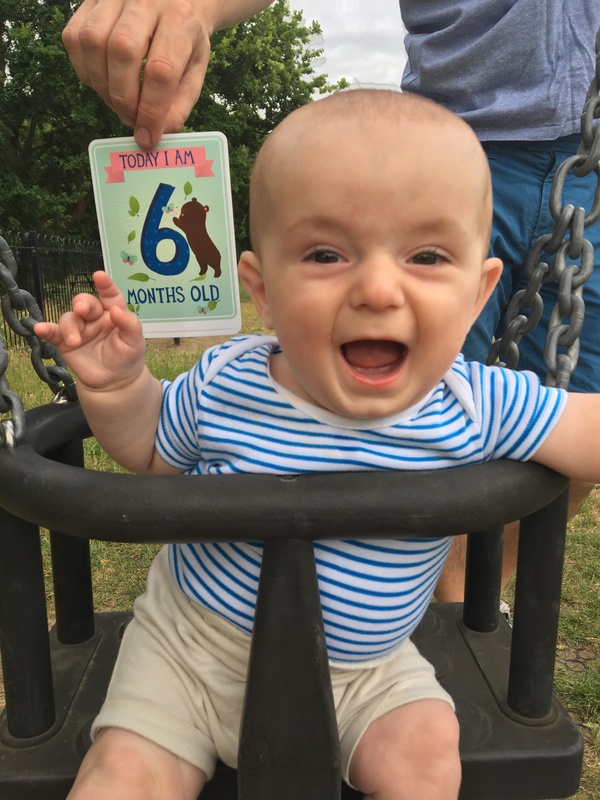 He REALLY loves the swings! We’re watching you Henry!!! 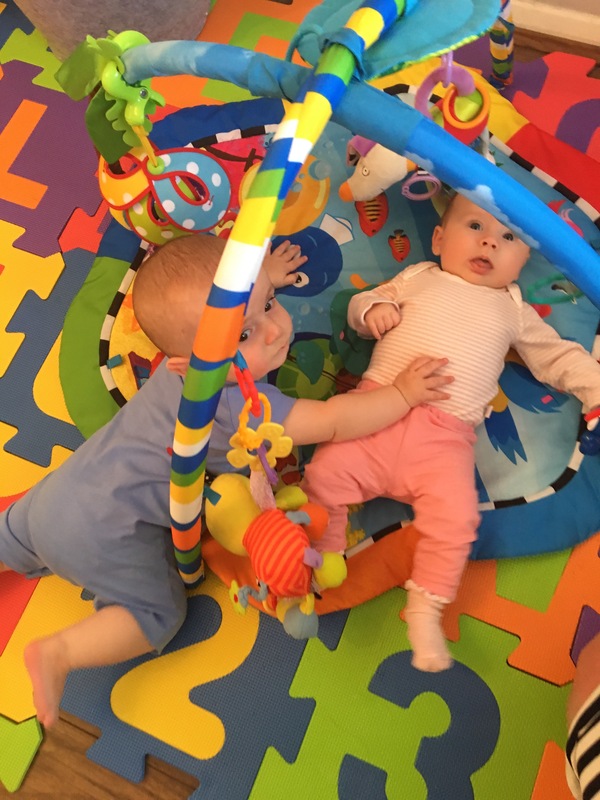 The gentle touch – on a playdate with his friend Emilia (the daughter of one my oldest and best friends). Every now and then I catch him staring at me. Whether that be on his changing table, when I am reading to him or even when I am feeding him. It’s a look that words cannot describe. It’s a look like no other being has ever given me. It is a particular look that can only be identified between me and him. I feel confident (a rarity for me) where I know it’s a look of love. 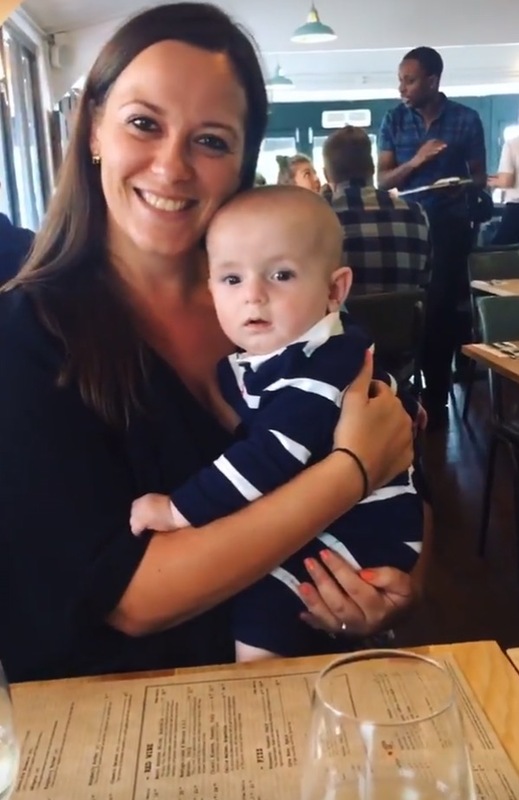 Henry knows I am his mummy, and there is nothing to beat that feeling. We all love our babies from the moment they are born (or even from the moment of conception!) but it is now that they begin to show us their love in return. Their little eyes light up when we enter the room, they smile at us when we peer over their cot to say ‘good morning’, they giggle at us when we pull funny faces and sing jingles and they cuddle us in return. It is the affection we now experience from them that feels incredibly rewarding and worthwhile. When they smile and love us (mummy and daddy), it’s more than any winning lottery ticket. When Henry is tired, I love holding him when he nuzzles in to my neck, his way of telling me he’s sleepy. When’s it’s bedtime I lay him in his cot and he becomes acquainted with his ‘bunny’ and ‘dog’ before gazing at Ewan the Sheep until he enters dream land. Every day he trusts and relies upon me to care for him, nurture him, bathe him, lay him to sleep and repeat the process everyday. He trusts and relies upon me to make sure he never feels cold, is clean and dry, is always safely strapped in and never goes hungry. He trusts me to fill his days with fun and my main objective every day is to ensure he smiles far more than he cries! This level of trust and responsibility gives me the biggest satisfaction, combined with a dose of pressure for his wellbeing as well as his happiness. For me, being a mother is the greatest job and I feel so privileged, I really do. I know only too well that from falling pregnant, having a successful (and stress free) pregnancy through to the end result of a safe delivery can all be very challenging – it is somewhat a miracle having a baby at all. Every morning when I hear him waking up and talking to his ‘bunny’ in his cot, reminds me how blessed I am. 6 months postpartum seems busier now than ever before! Since we have begun the weening process, I am literally either feeding him a meal or giving him a bottle every two hours – all of his bottles plus 3 meals a day. I’ve always been flexible and laid back with Henry’s routine but now I’m having to work to a (rough) schedule and be prepared to feed him a meal no matter of our whereabouts. I call it, “feeding time at Henry’s zoo!”. It suddenly makes the first few months seem rather low key in comparison, now that there’s a lot of “feeding time at the zoo” in my daily schedule as well as the realisation of “we’re on the move” with the sitting, rolling sideways (and somehow in a circle!) and almost commando crawling! I literally cannot turn my back for a minute. Let’s face it, in the beginning when the baby was sound asleep in his Moses basket, one would be able to sneak off for a pee occasionally! I’m currently enjoying the weening process. 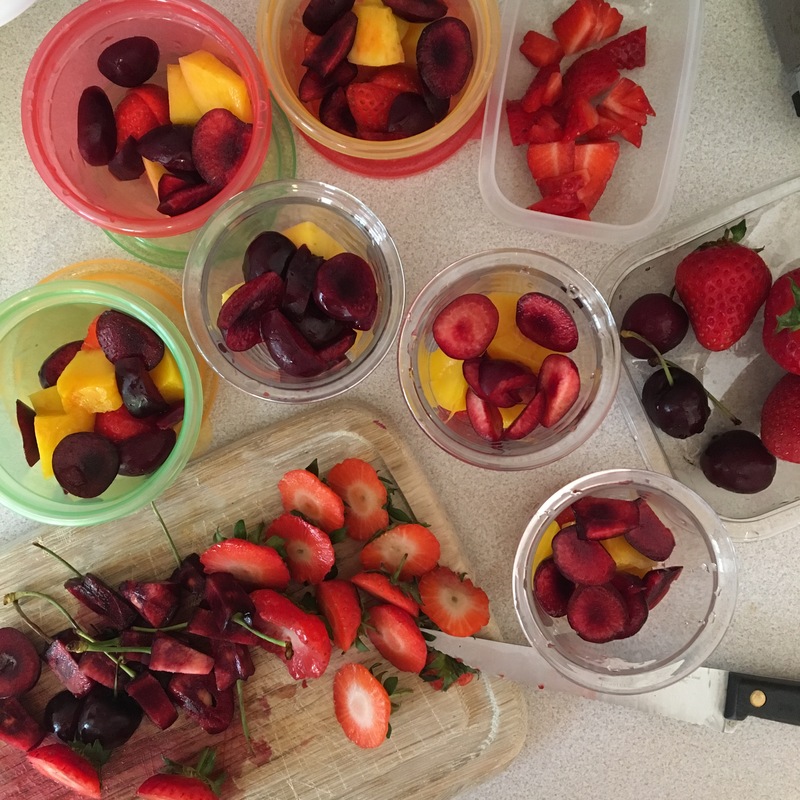 Preparing portions of fresh foods & to stock up the freezer. I felt I got my sh*t together at 3 months postpartum. But actually I think NOW is when I seem to have got my sh*t together a bit more. I can get out of the door more quickly, be on time for appointments and just enjoy a general feeling of being more in to a groove of life again! I give my all to Henry, but I must never forget entirely about me, and I’m not afraid to say that. 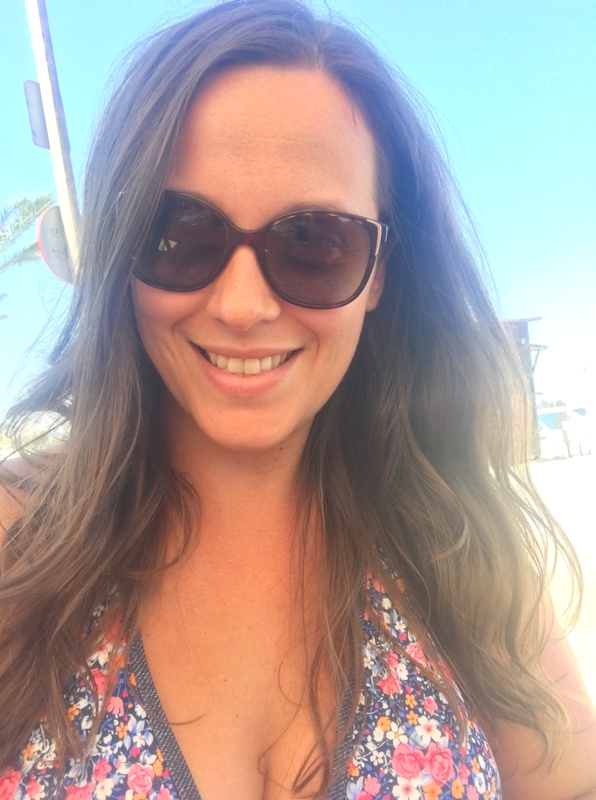 I’m typing this blog post whilst I am flying solo to meet a best friend in Ibiza for a quick 36 hours of sun and fun. My husband and my mother shared Henry duties for two days. 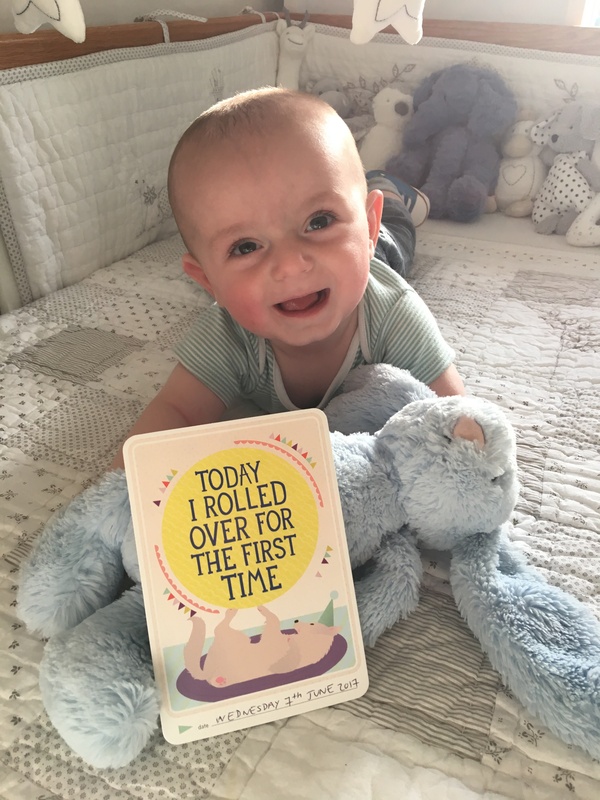 My husband got some amazing 1-2-1 time with Henry without me fussing in the way and when he had to go to work on day 2, my mum looked after Henry with no issues. I forget our parents were parents before and that they actually know how to change a nappy, bath and feed a baby!! 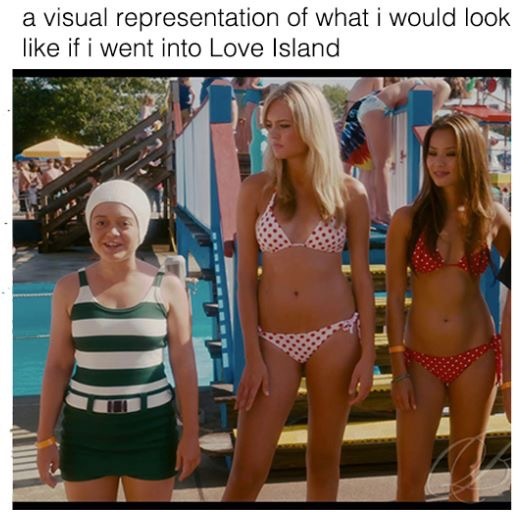 A 36 hour trip to Ibiza? Why not! I have recently registered to become self employed so I can explore all things #mumpreneuer and #mumboss which is very exciting! 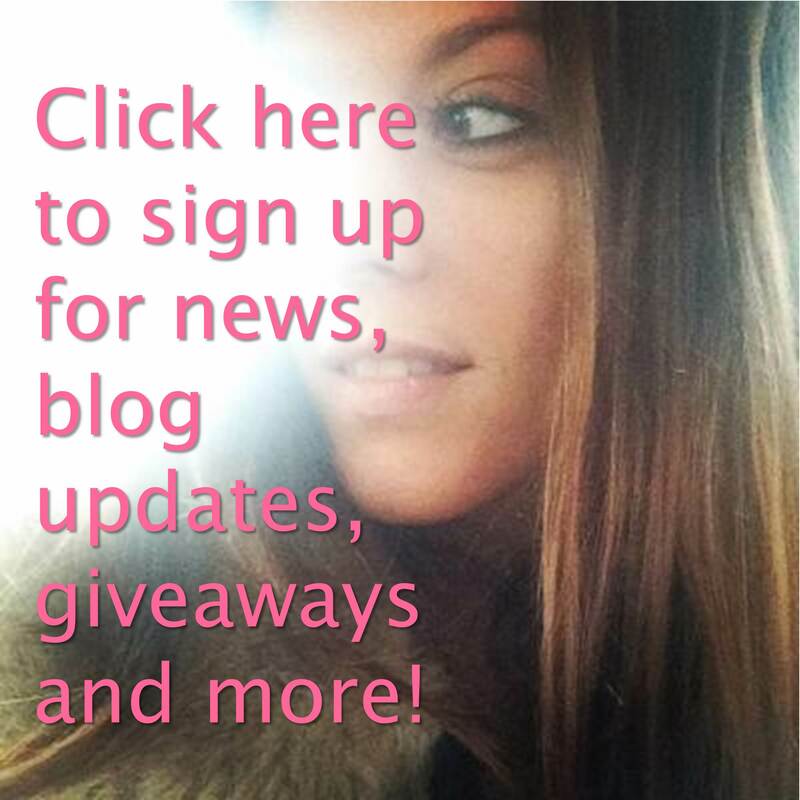 I love my blogging, it’s my escapism. 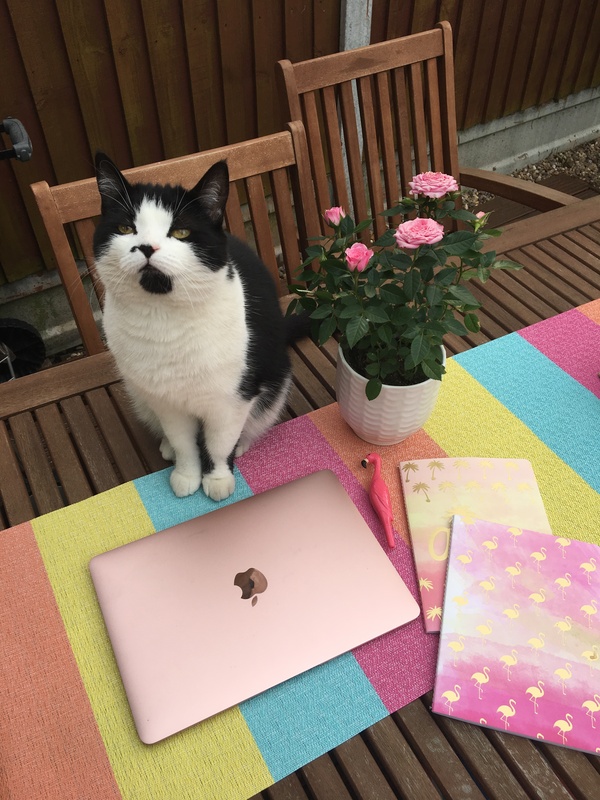 I have managed to keep up a bit of blogging here and there since I’ve had the baby, but I now feel more organised with a content strategy and lots of exciting content in the pipeline coming up. I love how it has become my job (well, one of them). Not spoken about on my blog before, but just before I gave birth to Henry I found myself in a redundancy situation in my full time job. (At 37 weeks pregnant no less!) That was not quite what I had planned (and certainly not the worry/stress free maternity leave I had hoped before Henry arrived!) 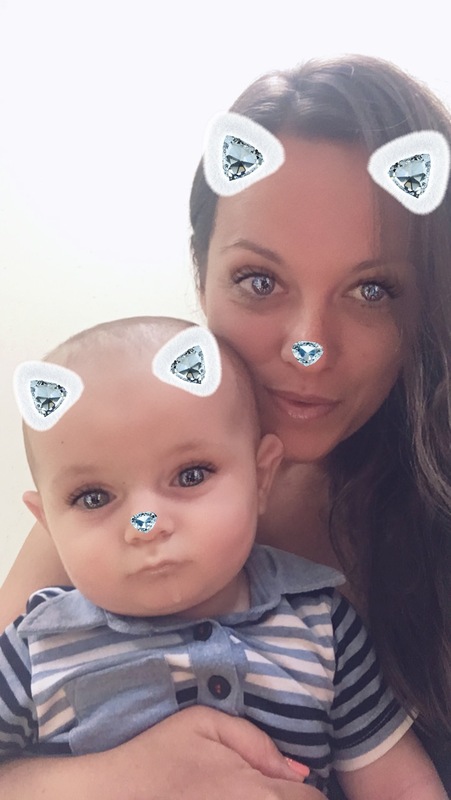 but it’s definitely worked out for the best as I can focus on being a mummy and use this time to focus on new adventures and to also commit fully and transparently to my blogging work. My new office is the best office! I’m not self employed just for my blog. I’m also working (and thus available!) as a marketing consultant (using my 14 years of brand marketing experience for renowned magazine and newspaper brands) whether that’s assistanting local small businesses get set up on social media, writing strategy proposals as well as assisting with events, PR and brand partnerships. 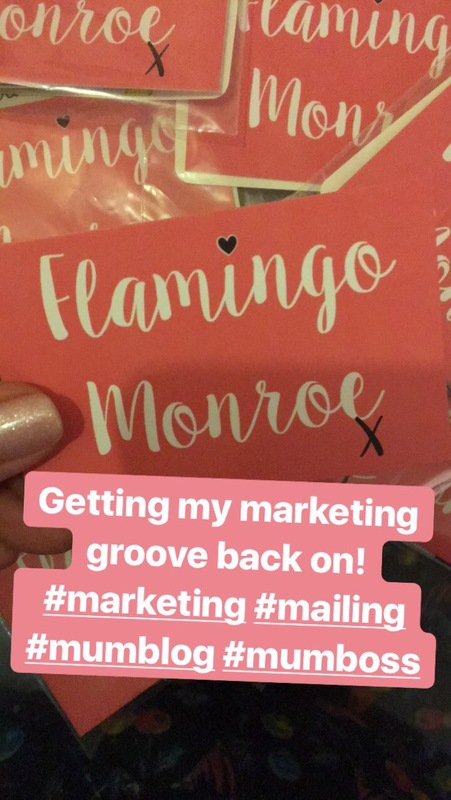 I’m also giving smaller clients simply an afternoon of my time to bounce off a few ideas and give them some informal marketing guidance and direction. In addition to this, I’m reinventing my beauty wheel from back in the day when I originally wanted to become a beauty editor. 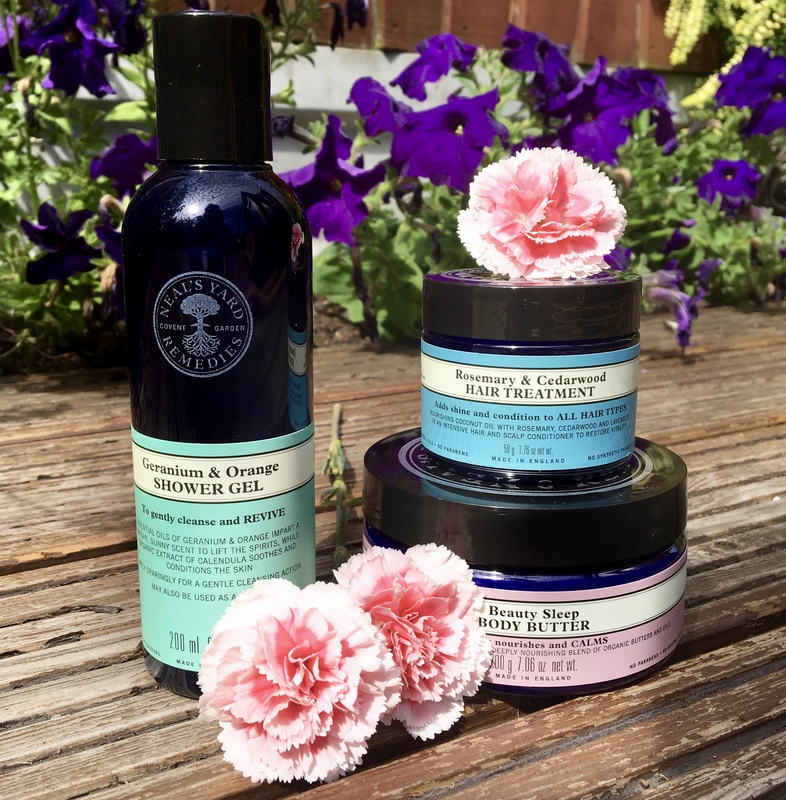 I have teamed up with the organic natural lifestyle brand Neal’s Yard Remedies – working like an ambassador – to create content for my blog, as a product sales consultant as well as hosting pamper parties and 1-2-1 appointments. It’s a brand I genuinely love and believe in and not a decision taken quickly or lightly. 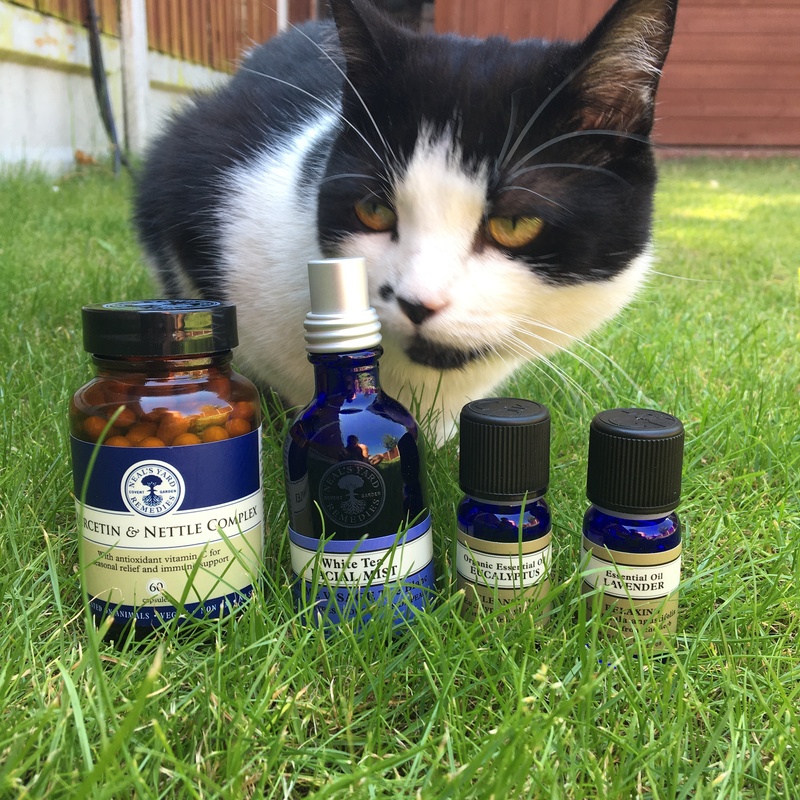 Since Neal’s Yard has cleared Henry’s Eczema I’ve become obsessed with the natural organic brand. I must acknowledge my husband, who for the first few months of parenthood would have witnessed my undesirable/lactating/sleepwalking/wired self and who became somewhat grateful when he no longer had to listen to my “udder machine”‘ pumping (aka expressing) milk whilst we TRIED to concentrate on a conversation or watch a film. We’ve naturally found ourselves in a healthy routine of having dinner together on an evening after Henry has gone to bed, where we catch up on all our happenings of the day. I learn more and more every day how blessed I am to have such a supportive and close network of friends and family. Henry adores his grandparents and I’m delighted he has lots of little buddies already that I’m so excited to watch him grow up with. Henry with his NCT buddies. I love watching them grow up together already! 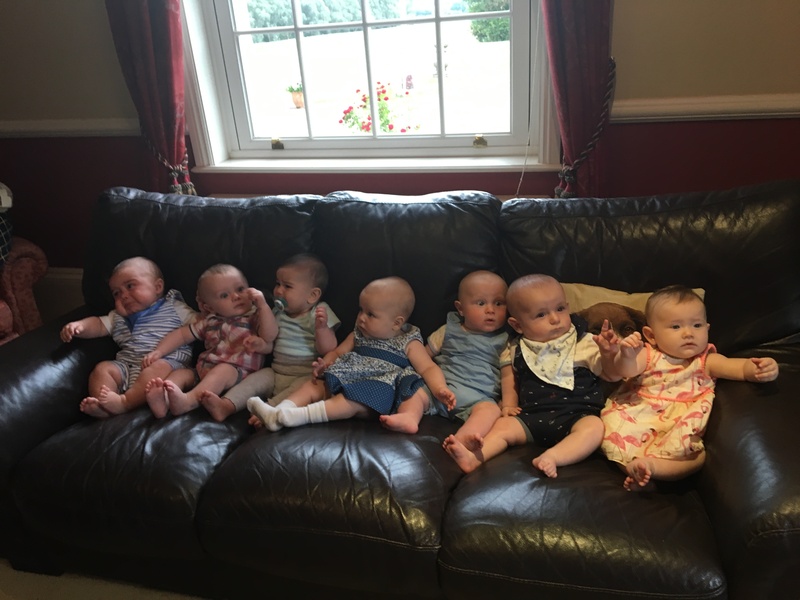 Our NCT group of new and amazing life long friends are invaluable too, as well as our existing friends – some who really have welcomed Henry in to their worlds and enjoy spending time with him, with us. Henry is a “brand extension” of me (hark at my marketing speak), he comes with me as part of a package but I’m also happy to have friends simply there for the wine, LOLs and no babies (which is fine also!). Some people in my life show little or no interest at all to see him or ask how he is, and that’s okay too (I’ve acknowledged before that Henry is my world and not necessarily everyone elses). 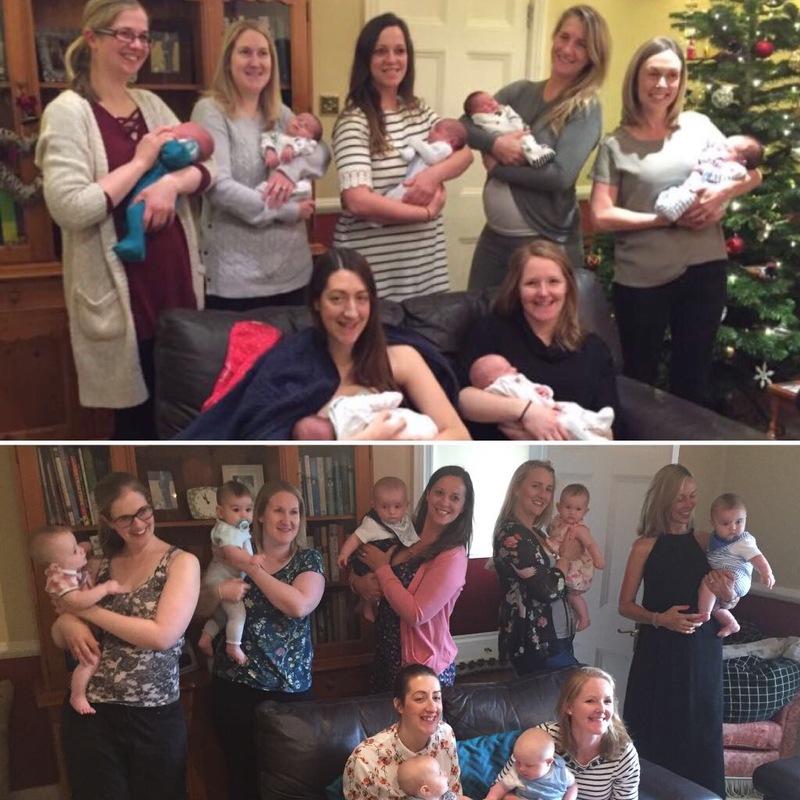 A then and now shot with my NCT group. One for the album for sure! Like I said earlier, I felt that at 3 months I was back in the game. But not as much as I feel now. 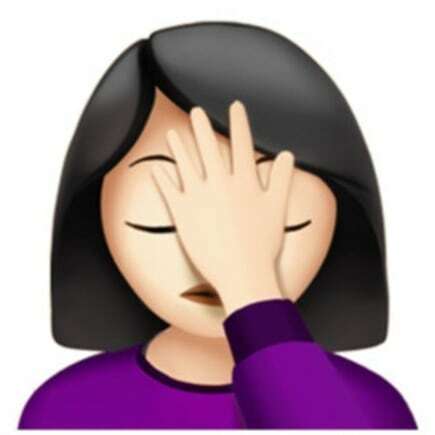 At times I still have days where I want to hit my head against a brick wall. One day only recently my husband came home, took one look at me and the state of the house and he left immediately to fetch me a bottle of wine! Some days are tough (i.e. when Henry is teething, over tired, fussing over food and crying for an unknown reason and when I haven’t eaten, showered or done any personal admin/work), but I find most days – even the hard ones – still rewarding and motherhood is a purpose I feel I am truly fulfilling. Right now, this is where I’m meant to be, not at an uninspiring lacklustre company, sitting at a desk in a stuffy office with poor air conditioning during a heatwave. Dolly is my styling assistant. Tee hee! There’s nothing to beat it and I look forward to every day.